"Ask about the neighbour before the house," cautions an Arabic proverb, "and about the companion before the journey." 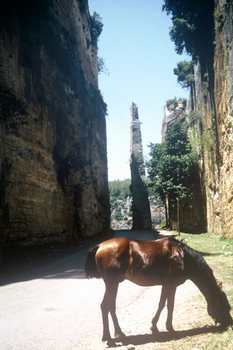 My companion was Madfaa, a pure-bred Arab stallion. If you lifted his thick black mane you found the freeze-brand hiding underneath in his coat of gleaming mahogany: a white swirl of Arabic calligraphy that attested his blue blood. His name meant Cannon. Cannonball might have been more appropriate, for he was small, round and tough. With flaring nostrils and a bright, knowing eye peering out from under the thatch of his forelock, he was more a creature of Thelwell than Haroun al Rashid. Here was the real McCoy. This was no pampered western darling bred with exaggeratedly dished face and long legs to spend a lifetime posturing in the show ring, eyes seductively darkened with vaseline; but, rather, a true son of the desert, hard, enduring and indestructible. He had been bred eight years before by the Shammar Bedouin in their spring pastures of the Jezira, the land beyond the River Euphrates. His present owner Basil Jadaan, a leading figure in the Arab horse world, had come to know Madfaa's breeder during the registration of Bedouin horses for the Syrian branch of WAHO, the World Arabian Horse Organisation. The man had subsequently fallen foul of bad faith in a client to whom he had sold a mare, and Basil had stepped in to help. Custom, but not law, decrees that the first foal of a mare after she is sold should be given to her original owner. 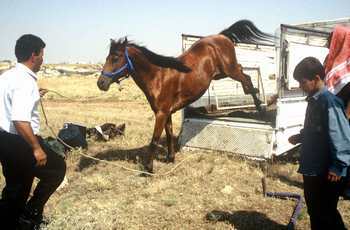 The purchaser, however, had reneged, demanding a price for the foal. Fearing to lose his bloodline but unable to pay, the Bedouin had asked Basil if he could intervene. "My business was doing well at the time, al-hamdu li'llah," said Basil quietly, "so I was able to help him." Thus, self-deprecatingly, he dismissed an act of typically Arab generosity: Basil had actually bought the foal himself and presented it to the Bedouin. Gratefully, the man returned his gift with another horse - Madfaa. 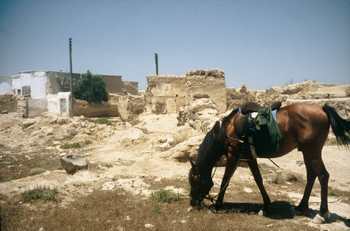 …My pipe-dream of travelling through Syria with an Arab horse was now on the point of realisation, thanks to Basil. 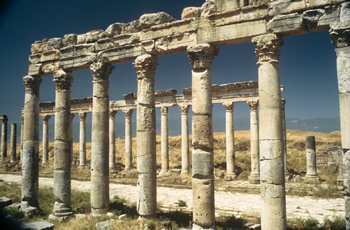 Hoping to experience as much as possible of the cultural and geographical diversity of this unusual country, I intended to join the River Orontes at Hama close to where it enters Syria from Lebanon, and follow it north almost to the Turkish border. From there I would find my way through the coastal mountain range to Lattakia, where old friends would give me a rest from the road. Then it would be back into the mountains, working my way ever southward until Lebanon barred my way. Skirting its border, I would then head due south for Damascus, bringing Madfaa home along the very edge of the Badiyat ash-Sham, the great desert which stretches to the Euphrates and on into Iraq. According to the proverb, I had done it the wrong way round; I had planned my route long ago, with no foreknowledge of my companion. But from my first meeting with Madfaa, I knew I had had the luck to get away with it. 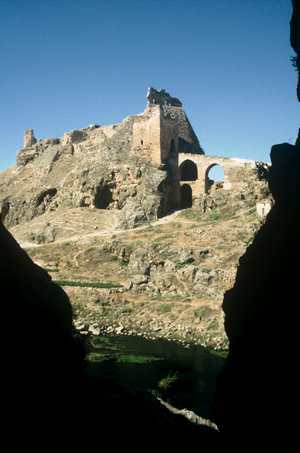 Sheizar Castle, sitting like an eagle on its crag to spy over the river valley far below, is surely the most romantic of all the castles in Syria. The fortress here must have been ancient when warrior Pharaohs first inscribed its name in hieroglyphs upon their temple walls. But the account of the mediaeval soldier-scholar Usamah ibn Munqidh brings its past most vibrantly to life. It was Usamah's grandfather who finally wrested Sheizar from the Byzantine Emperor for good, after many centuries in which it had passed like a shuttlecock from Arab to Byzantine hands and back again. Recording his memoirs in the first century of the Crusades, Usamah draws a colourful picture of life in Sheizar when the only fit occupations of a gentleman were fighting and hunting, or - for a rainy day - making copies of the Qur'an. Written in the style which inspired the later mediaeval romances of such as Malory, his book is a treasurehouse of knightly tales: of daring exploits against overwhelming odds, of capture and ransom, of chivalry and occasional duplicity. A friend of both Saladin and the Frankish King Fulk of Jerusalem, Usamah presents war as a sporting league, where the Crusaders were just another away team along with the Isma'ilis of Masyaf and the Lord of Afamia and the men of Hama, where a severed limb was as much an accepted occupational hazard as a torn hamstring, where you might go to a man's wedding one day and bludgeon his brains out the next, with no offence meant and none taken. He opens a window on to a world seemingly of fairy tale and make-believe; a world which came to a premature end for his family when an earthquake toppled the castle, burying most of his relations. It must have been a colossal tremor, for it twisted the foundations of the keep some ten degrees out of true, a fault which not even the later Mameluke overlords sought to remedy. Otherwise they rebuilt mightily, for more than eight hundred years later the tower is intact to its roof - the only part of the castle, other than the gatehouse, which survives. From its top I could see how the plateau ended abruptly above a vast plain, the nothingness that I had felt beyond the ridge of Mahardah. It was a parched landscape of bare stubble-fields and shrivelled grass under a baking sun, striped green by the river and its surrounding irrigation. Far away the blue ridges of the Alawi Mountain shimmered in a heat haze that was intensified by stubble-fires burning vigorously even now, in the early morning. Afamia was founded by Seleucus Nicator, Macedonian heir to this part of Alexander the Great's empire. But it was his Roman successors who built for posterity, and up whose colonnaded street I now rode. Madfaa must have sensed the ghosts of the past more strongly than I, for two millennia ago horses outnumbered people in the plains and foothills hereabouts: the military stud of the Seleucids, once more than thirty thousand head of cavalry remounts. "You can't sleep here." He had a little English, but not enough to say what was on his mind. "It's... bad." "What's the matter with it? It looks like a great place to me." He frowned. "Snakes," he said gravely. It was the same later with the gardiens, the officers who keep the tourists from damaging the site or, in my case, the site from damaging the tourists. But, besides being thrilled with the thought of sleeping among these ancient stones, I was far too exhausted to saddle up and move on. Anyway, there was nowhere else to stay. I promised to keep an eye open for hungry-looking reptiles, and they reluctantly left me to it. There was plenty of rubble here to make my hearth, and with a chunk of masonry to block off a chimney I brewed pot after pot of tea while I considered the options for laying out my bed. The fluted alternating spirals on the columns opposite turned yellow as a peach while the sun slid behind the Alawi Mountain; then faded to grey. An owl began to stir from its perch under a pediment, swivelling its head to keep a wary eye on me. …..The gardiens came back. They had changed their minds. "You can't sleep here," said the older of the two. "It's a bad place." "I know," I said. "There are snakes. Too bad." They were offended that I hadn't taken them seriously. "There is the dad." "What's the dad?" I had a strong sense of déjà vu. "The dad.” He repeated darkly. “It'll eat you. It's fifty metres long." Oh yeah, I thought, and I bet it wears a tartan beret. "Just think, madame. Fifty metres long." Here we go again, I thought. Playing for time, I brought out my dictionary. The dad wasn’t among its vocabulary, but it made amends with a splendid centrefold showing the natural history of the Arab world. The younger man took it, scrutinising the bestiary. For a moment his finger hovered lovingly over the picture of the Nile crocodile; then, obviously realising that this might be pushing his luck a bit too far, he closed the book with a shake of his head and handed it back. It seemed the dad had so far eluded the notice of the world's zoologists. A couple of hundred yards brought us to the foot of the ravine, where a bridge spanned a stream bed littered with huge boulders. Slowly, in the heat of the day, we climbed the far side, Madfaa stopping every few minutes to snack by the roadside. The walls of the ravine came down to meet us. As dressed stone began to appear at their top, they opened suddenly to admit the road, which here turned sharp right into a gap. I followed it round; and stopped. Saône wasn't entirely ruinous after all. But that was the least of its surprises. Picture the shell of an old abbey; the roof long fallen in and rotted away, only the walls of the nave remaining. The transepts have one wall only, and in place of the choir is a steep mountainside. Now take out the mortar and blend the stones seamlessly, so that a single block reaches a hundred feet from floor to top. Where there might have been windows, paint in splashes of creeper or dark green bushes, growing from heaven knows what foothold in those sandpapered walls, so that the only light comes from above, barely reaching the floor. Where the nave altar would have stood, place a single column, a square-sectioned obelisk cut from the same living stone and to the same height as the enclosing walls. Replace the flagstones and chiselled memorial tablets with grass, but keep some of the echoes and all of the awe. And this is only the castle moat. People have forgotten who cut this breathtaking ditch, using only mallet and chisel and muscle and sweat… The Frank, Robert of Saône, began the reconstruction of the fortress… Before he could finish it, he was captured during an unsuccessful assault on Damascus, and opted for death rather than conversion to Islam. The Turkish commander, in the time-honoured custom of his Central Asian forebears, set Robert's skull with jewels as a drinking-cup. 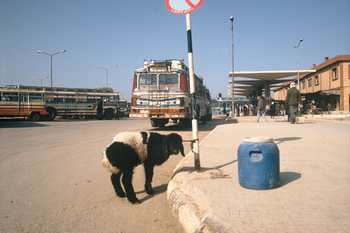 The bus station in Homs was frantic and shambolic; just as I had always known it. No, more so. The crowd was denser than ever, its pressure more intense. A greater multitude of traders made a more colossal noise, so that the private drivers shouting their destinations had to shout louder than ever to make themselves heard. It had felt strangely exhilarating, after weeks of slow movement on horseback, to mount a serviis bus and whizz down the motorway I had tried so hard to avoid the day before. After a long time in wild and largely empty countryside, Homs seemed a sparkling metropolis, instead of the miserable, rather grotty place of my memories. Only the bus station, with its hum and bustle, its chaotic unfocussed sense of purpose and, above all, its throbbing demand for departure to new and exciting horizons, had ever raised my pulse rate before. Here I’d sat eating falafel to the deafening roar of Vangelis bashing out the signature tune to Syrian radio; had perched, for lack of a remaining seat, on the engine cover of a rickety old charabanc itching for its departure to the Palmyrene desert. And here I’d been rescued by Ayman. That was the year that proper snow fell on the Homs plateau, six inches of serious white stuff that paralysed the roads and trains, bringing all public and most private transport to a stop. On my way back from Palmyra to Damascus I’d made it thus far, only to find that it looked as if I’d be spending the night on the floor of the station while everybody waited for a thaw. That was when I fell in with Ayman and his chums. A bunch of army lads travelling south from their Aleppo barracks, they had just four days’ leave to spend with their families in Damascus, and had no intention of wasting a minute of it. Covering my shivering shoulders with a thick army jacket, they towed me with them round the town, visiting acquaintances and calling in favours until they persuaded someone to drive them south. There followed one of the hairiest journeys I have ever known. Given good conditions and a modern car, Syrians are not generically safe drivers. This guy, in an old banger with bald tyres – nobody with a posh car was prepared even to think about the journey – dealt with the snow by pretending it wasn’t there. Over the next four hours I learned a whole new dimension to the idea of correcting a skid. The episode left me with my first grey hairs, and a permanent soft spot for Syrian soldiers. The old city mound rose from the horizon and swelled to fill my view. No need of a map, here. In a surreal moment we left the last tiny village of al-Haw and tripped over a great four-lane highway. It solved the problem of how we were to cross the river. The Orontes here resembled the Cherwell, running sluggishly through low banks fringed with willow and edged by sandbanks. People idled beside it, and small boys jumped and dived like porpoises in the clear water, while sunbeams cut like diamond through the fountains they sent up. Seen through such a foreground the dry, crumbling mud of the ancient city, rising high above the houses on the riverbank, seemed more alive. Madfaa and I crossed the last spur of water, fielded a few good-natured catcalls from the boys, and climbed the hill. … Kadesh today was virtually abandoned. These days people no longer retreat to the heights for safety, and the inhabitants of the town bearing the name of Tell Nebi Mend live on the plain at the foot of the earthen mound. 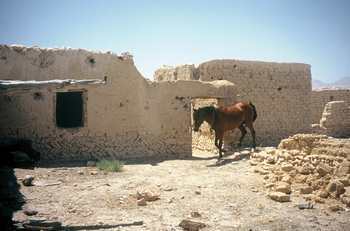 The few mud-brick houses that remained on its top were crumbling and empty. There were no children playing in the streets. Deserted yards stood open to the wind, which was howling down as fierce as ever off the Lebanon ranges. I half expected to hear saloon doors crashing behind me in the gale, the ultimate cliché of the ghost town. 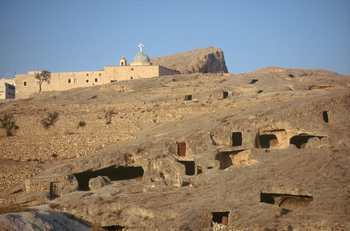 From below, the huddle of buildings on the hilltop looked more like a Moroccan kasbah than a Syrian village. No sign of life moved in or around it. Was it inhabited, or empty? If it was inhabited, I thought, I’d ask for a bucket of water, and half a bucket of tea. If it was empty, I’d take it over for the afternoon. It was empty. And it was almost a kasbah. The greater part was a single complex of houses, stables and yards, presenting a blank face to the outside, and intruders. Nevertheless we intruded easily, for the gate swung readily on its hinges and most of the houses lacked doors. A large corral filled much of the interior, beside a smaller yard on to which fronted houses and barns alike, semi-derelict. Mud-brick formed the walls, their plaster fallen off here and there to show the familiar herring-bone style. The roofs were of brushwood supported by ancient beams, some fifteen inches thick and bleached as white as the surrounding desert. The accumulation of centuries of animal-dung caked the barn floors. …In a barn I found treasure - a huge pile of tibn - and scrumped a bucketful for Madfaa. A rough wooden ladder against the wall took me to the roof, where a single second-storey room stood out like an observation post. I looked across to where Madfaa was mooching in the first yard, tweaking the odd dried stalk, his barley finished; then on and up to the mountains, a line of pale brown mounds with which this deserted homestead was completely in harmony. If it really was deserted; the tibn suggested otherwise. Although past ghosts whispered in the corners, the present was here too, somewhere. The owners might have shut the far gate behind them at exactly the moment I’d walked in the near one, the echo of their footsteps still hovering among the rustle of the leaves in the roofing twigs. While I was away, Madfaa had done some exploring of his own. I came back to find him emerging from one of the stables, having long since learned to associate “inside” with food. So I left him inside a barn where he could eat his stolen tibn as privily as possible. There was something of Anne Boleyn about Wahidi. Perhaps the black coif (worn in respect for a recently deceased brother-in-law), with its edging of gold beads, put me in mind of the jewelled head-dress of the famous painting. Or perhaps it was something in her eyes, a worldly-wise and faintly cynical expression; although there was nothing there of sexual awareness. She was about thirty, older than your average unmarried daughter. Looking at her lithe, slender figure and intelligent features, I was surprised that no-one had claimed her thus far. To my discomfort, she read my thought. She regarded me with a quizzical detachment, her thin, mobile face twitching with amusement, the corners of her mouth curving upwards with quirky irony. She had good reason to be amused at my antics. By now trembling with exhaustion, I was quite inarticulate. As I bumbled my way through introductions and explanations, I must have seemed like a babbling idiot. And I couldn’t even feed myself properly. After all my practice with the flat Arab loaves, used at table as a scoop, a spoon, a mop and whatever else you need to minimise the cutlery, I was usually fairly dexterous in my eating habits. Tonight, every attempt at eating ended in slop on the communal tray, or slop down my own clothing. After watching me for some minutes in silent embarrassment, someone quietly and tactfully handed me a spoon, as though I were an infant. Over supper, my communication difficulties continued… Suddenly, I realised why. Ma’alloula is famous as the place where Aramaic, the ancient language of the Middle East which is the parent of both Arabic and Hebrew, is still spoken. And Ma’alloula was only a few miles up the road. Excitedly, I turned to Wahidi. … Had I been travelling these parts a little under three thousand years ago, I should not have willingly gone home with an Assyrian. The very word was synonymous with violence and destruction. But he did not have the last word. Safe in their mountain retreats from Mesopotamia’s latest superpower, a new-born Babylon, the Assyrians maintained their identity with the extraordinary tenacity that characterises so many Asiatic clans. Today only a small handful of scattered communities survive, mostly in the north of Syria and Iraq. I hadn’t expected to meet them here; but, given the cultural and ethnic diversity of the Levant’s coastal mountains, I should have been ready for any surprise. 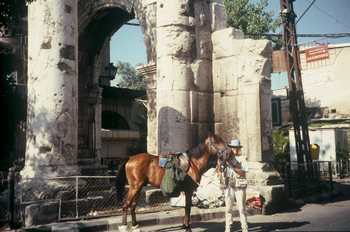 We passed close to Saladin’s tomb and reached the Great Mosque at the corner of its main entrance, by the Roman columns. Here we picked up the end of the Souk Hamidiyeh; left, right and left again, ducking under the canopies of vines that drape the road past the long side of the Mosque. The road here was like glass. Poor Madfaa slipped and fell to his knees. He scrambled to his feet shaken, though unhurt. But it was the last straw. I rummaged in my Useful Bag for anything that might help. The first thing I found was baling twine. I tried tying it round his shoes, wedging it under the loosened heels, to give him some grip. Then I saw a piece of sacking lying in the gutter, and had a better idea. I was trying to put it into practice when a friendly shopkeeper threw up his shutters, prepared to open his haberdashery store, and saw me struggling. Wonderful man; he came to the rescue with two large pieces of strong canvas. Together we made pads for Madfaa’s hind feet. Wrapped like poultice boots and tied around the pasterns with baling twine, they gave enough friction for the little horse to continue safely. …After less than half a mile we arrived at Bab Sharqi, the biggest of the city gates. The roar of traffic warned me that we had to leave the safety of the Old Quarter and launch ourselves on to the busiest street yet. The other side of Damascus: the home straight. Published by Long Riders' Guild Press US (2007).